The healthcare industry in Louisiana continues to expand rapidly, and medical assistant positions offer students an opportunity to be a part of this growing field. According to a 2014 report from the Louisiana Hospital Association, the healthcare industry is the state's largest employer by payroll, and wages for healthcare employees are notably higher than many other jobs in the service sector. Louisiana's numerous colleges and vocational schools provide a variety of options for starting a career as a medical assistant. The increasing availability of online classes and distance learning programs make training to be a medical assistant a viable option, even for those already employed in other fields. Medical assisting is a good place to start for those interested in helping others and working in the health care field. Medical assistants work closely with physicians and patients, helping to reduce wait time for patients and taking care of some of the back-office work in an office or hospital. To land your first job in the field, you first must earn a certificate or degree in medical assisting, which means finding a school that meets your professional goals and personal needs—including cost, programs available and student reviews. 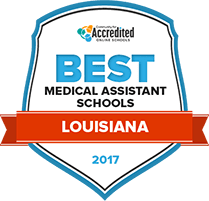 Our 2017 Top School for Medical Assisting in Louisiana list is your starting point. Because the career of medical assisting is expected to see a growth rate of 29 percent through 2022, Bossier Parish Community College has put special effort into developing a medical assisting program to fill these positions. Students will accrue all skills necessary to work as a medical assistant, including recording medical histories, preparing patients for examinations, and performing basic medical procedures. Learning at BPCC is a flexible experience that incorporates online courses, evening courses, and even weekend courses. Students enrolled at BPCC will be able to meet with a variety of personal tutors to help support their academic pursuits. There are a number of educational paths to a career as a medical assistant in Louisiana, including an associate's degree or a certificate program. The search tool below helps prospective learners find a program tailored to their needs. The Louisiana State Medical Board has consistently understood the practice of medical assistantship to fall under the ability of physicians to delegate clinical tasks and does not require certification. However, trends in the healthcare industry and recent rulings by the Centers for Medicare and Medicaid are making certification the presumptive standard for medical assistants in Louisiana. Although Louisiana does not require medical assistants to be certified, many employers look favorably on certified candidates and increasingly require certification. Here is a list of national certification programs for medical assistants. Is a formal education or training required? National certification programs require medical assistants to possess some formal education or specific training. This is most often a high school diploma/GED and completion of an accredited medical assistant program. The level of training required in Louisiana depends on the task being performed and the level of supervision. For example, in order for medical assistants to draw blood samples or perform laboratory tests they must be certified by the state medical board. Venipuncture Completion of a national certification exam OR an exam administered by the Louisiana State Board of Medical Examiners. Laser or chemical skin treatments Training in safety and application techniques for each system. Individuals must also understand cutaneous medicine, pre and post-operative care, possible complications, and the types of infectious diseases involved with each treatment. Laboratory Testing High school diploma or GED, completed laboratory competency checklist, or a passing score on a national exam approved by the Louisiana State Board of Medical Examiners. Are there healthcare support tasks outside the scope of medical assistants in Louisiana? Administering medication in the absence of physician. Clinical tasks such as independent medical assessment, triage, and prescribing or renewing prescriptions. The following 2014 salary figures from the Bureau of Labor Statistics offer a comparison between medical assistant earnings in Louisiana and medical assistants nationally. Medical assistant salaries in Louisiana can vary widely, with the greatest difference being between metropolitan areas, such as New Orleans, and rural parishes. The Bureau of Labor Statistics projects healthcare support occupations will see record growth-more than 20 percent-over the next decade as the U.S. population ages and the healthcare industry continues to expand. This is good news for anyone looking to pursue a career as a medical assistant. These professionals can be found in every facet of healthcare and the occupation stands to benefit greatly from these national trends. Below is a comparison of projected employment growth for medical assistants in Louisiana and nationally. When starting a career as medical assistant in Louisiana, the number of available schools and other educational programs can be daunting. The state has a large number of local colleges, community or junior colleges and vocational schools awarding both certificate and associate degrees to set learners on the path to becoming medical assistants. Many of the programs also offer additional training in specialty areas such as administrative assistantship, medical coding, and clinical skills to expand employment opportunities and earning potential. Here are few schools to get you started with your research. This governmental agency is responsible for managing and regulating the provision of health services in Louisiana, specifically Medicare, Medicaid, and public health programs. Medical assistants planning to work in Louisiana hospitals should be familiar with this agency and its resources for medical professionals regarding state health regulations. For those interested in public health opportunities, they also have a recruitment page. This healthcare provider serves residents who qualify for Louisiana's Medicaid and CHIP programs, Louisiana Healthcare Connections serves more than 350,000 individuals across the state. Their careers section offers a wide variety of job listings in the clinical and nursing categories, with numerous locations - both rural and urban - available. The State Medical Board is responsible for licensing medical professionals who practice in Louisiana. They have a number of rulings and opinions that relate to the scope of practice for medical assistants in the state. This paper has an active jobs listing that include opportunities for medical assistants in Louisiana's fun and famous city. If you are looking for a promising career in a historic and cultural center, start your search here.